coconut | What's Cooking at the Genua's? It’s been a while since I posted but I’m back! I made this recipe for our Halloween Party at my new job. (Ok it’s not so new anymore) Everyone knows how much I LOVE to dress up (NOT!) so instead I made a dessert. Normally dessert is not my go to recipe realm but I keep trying! Never give up! Anyway…. I found this recipe on Taste of Home. It was originally called Pumpkin Delight Magic Bars. After reading the reviews I decided it would be a good choice. Though as the reviews do state, the toppings do tend to fall off a bit after it’s baked. Not a big deal but even when I was determined to ‘fix’ that by making sure I pressed the toppings into the cake before baking, it did no good. Oh well! I think the next time I make it I may put some of the topping inside instead. Either way, this recipe came out amazing! I didn’t have any leftovers at work! Score for the newbie! The recipe says it makes 24 bars. I thought they might be too big so I cut them in half and got 48 small bars. Worked out great. But what to do about keeping the topping under control? I put each bar into a cupcake liner! This way it kept everything neat! Easier to transport and display as well. Preheat oven to 350ºF. Great a 13×9 inch baking pan. Place the vanilla wafer cookies in a food processor* and pulse until coarse crumbs form. Drizzle in the melted butter and pulse until blended. Press into the bottom of the baking pan. In a large bowl, beat the cream cheese, sweetened condensed milk and pumpkin pie spice until smooth. Beat in the pumpkin. Stir in cranberries. Pour over crust. Layer the coconut, baking chips and pecans. Loosen the sides from pan with a knife of spatula. Cool completely. Cut into bars**and refrigerate leftovers. * If you don’t have a food processor you can just put the cookies in a large Ziploc type bag and smash them until they are crumbs. ** I recommend cooling completely in the refrigerator and then cutting them. Makes it easier to cut. 1 bar: 299 calories, 17g fat (8g saturated fat), 25mg cholesterol, 144mg sodium, 35mg carbohydrates (28g sugar, 2g fiber), 4g protein. I BAKED!! I know what you’re all saying…(But you don’t bake!) But I tried yet again, I refuse to give in on this. And it’s not really from scratch, it’s semi-homemade. I added my own touches and it worked! It came out amazing! So moist, rich and tropical! Oh and I even made the frosting from scratch! It was so easy! Go figure! I had this cake mix in my cabinet for months, I bought it online for like a dollar and it was past it’s “best if used by date” by a few weeks so I figured I’d be adventurous. Originally I was going to make cupcakes but I thought I better just stick with a sheet cake this time. I toasted up some sweetened coconut flakes I had in the pantry also (they came out a little darker than I wanted but they taste great so all is well), and topped the cake with them. After tasting a small piece I wanted to eat the whole cake! WOW! Success!! I can bake I can bake I can bake!!!! So without anymore self-praise here is how I did it. Heat oven to 350°F. Grease bottom of 13 x 9 pan with cooking spray or butter with a dusting of flour. Once cool, frost the cake. In a large bowl beat(cream) the butter and cream cheese. With the mixer on low-speed add the sugar a little at a time until smooth and creamy. Place the coconut on a cookie sheet in a 350°F oven for about 2-5 minutes. Check after 2 minutes so it doesn’t burn. It goes quick once it starts to toast. Cool before putting on cake. Ever have one of those “hump” days that make the “hump” seem like it’s Mt. Everest? Well today was that day for me. I also think I should have made my New Year resolution something other than exercising more. I think it should have been for me to do my blog in the MORNING!! Well today’s mess started yesterday morning. Took my half-and-half out of the fridge for my coffee and thought the container seemed a little on the warm side. Hmmm…Started checking other items. Same thing. Freezer check. Most still frozen but a few items were soft. Not a good sign. So I put thermometers in both places and my fridge was reading 60 degrees! Um that’s not right! And the freezer was almost 50! Also not a good thing. So I cranked the temperature to the highest it would go and by that night the fridge only dropped maybe 5 degrees. Same in the freezer. So I called the service dudes. They told me they’d be here sometime today between 8 and 5! As usual! And they’d call 30 minutes before they arrived! OMG! I was now trapped in the house all day. Afraid to go in the shower for fear the guy would of course show up without calling or something. Couldn’t do anything! Then later in the afternoon I get my delivery from Apple computers with my new iLife 11 software for my iMac. A third of the way through the installation it froze!!! OMG again! Now I’m on hold for tech support and of course the service guy beeps in! He’ll be there in 30 minutes! Yikes! Go back to Apple and they guy on the other end is saying Hello?? Ok so we shut down my iMac (Fiona, I name all my computers) and we try again. He stayed on the phone with me the entire time. All went well! Just a brain fart! It happens. I was scared to do anything for fear I’d erase my entire computer! (that is how you get when you have PCs for most of your computer using life and they always have issues) And for anyone who knows me I am totally attached at the hip to my computer. So as I am saying thank you and hanging up with Apple the repair guy shows up! 5:00! 40 minutes later my fridge is working. For now. Some defroster/heater or something. I needed a drink! So here I am, at 7:15pm finally doing the blog! And now that I’ve put you all to sleep with my ramblings…Here is today’s recipe. This is a low-calorie dip and so refreshing and different from your usual ranch veggie dips or whatever else is out there. I love making my own dips, I know what is in them and I know what isn’t! You can even serve this dip with grilled shrimp or pork or put it on a burger! Versatility is a wonderful thing! 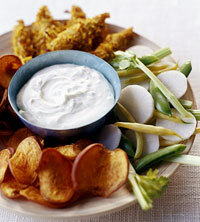 And the “firecracker” is the explosion of flavor you will get from the wasabi or horseradish. If you don’t like it too “hot” put less in. But its sooo good!! 1. In a medium mixing bowl beat the cream cheese with an electric mixer on medium speed for about 30 seconds. Beat in the sour cream, coconut milk or cream of coconut, wasabi paste, ginger, lime peel and lime juice until smooth. Chill for at least an hour. Always better to let dips sit and mellow out. 2. Serve with carrots, sugar snap peas, celery, peppers or any other vegetables you like! Well here it is again, almost 7pm and my blog is still not ready for today. But here we go. I found this recipe on Food Network back in 2008. It is one of Alton Brown’s recipes and it is full of calories and downright deliciousness. The cookies are definitely NOT on the diet list. But like I’ve said before it’s the holidays and no calorie counting till the new year. The cookies are also very rich and sweet so be careful eating them. They are very addicting. 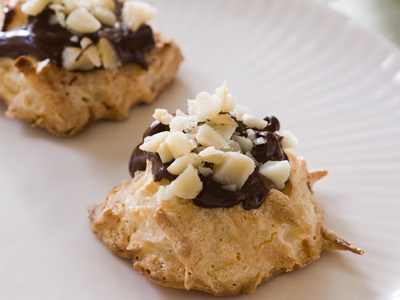 Not only are they addicting but they are really easy to make also. Easy and decadent! 2. Combine the coconut with the sweetened condensed milk, salt and vanilla in a medium mixing bowl. 4. Gently fold the egg whites into the coconut mixture. Scoop tablespoon-sized mounds onto a parchment-lined half sheet pan and bake for 20 to 25 minutes or until golden brown. Immediately transfer the parchment with the macaroons to a cooling rack. Cool completely before topping. 5. Fill a 4-quart pot with enough water to come 2 inches up the side, set over medium heat and bring to a simmer. Combine the chocolate chips and shortening in a small metal or glass mixing bowl and set over the simmering pot. Stir occasionally until melted, then remove from the heat. 6. Dip the cooled cookies in the chocolate mixture, sprinkle with the chopped macadamia nuts and place on parchment paper to set, about 30 minutes. What says Christmas more than a beautiful red poinsettia. I continue to buy them every year, they just make everything more Christmas-like. I even plant them outside when Christmas is over. Here in Florida they continue to grow long after the holidays. We’ve had them get pretty big too, until the landscapers did something and killed it. I think they poisoned it or something but I can’t prove it. Anyway…When I saw this recipe it sounded really cool. I could not find a picture however and I have not made them yet. So you can use your imagination on it until I bake some and post the photo. They are a pretty simple cookie to make also. You can make the dough ahead of time and use it later. 1. Preheat oven to 350º. 2. In a large bowl, with an electric mixer, cream together the butter, sugar, egg, water, and vanilla until well blended. Gradually add the flour, baking powder and salt until well combined. 3. Stir in ¾ cup butterscotch chips and the coconut. Cover and chill at least one hour. 4. Cut the candied cherries in half. Then cut each half into 3 slices. 5. Shape the dough into 1-inch balls and place on ungreased baking sheets. Flatten each ball and place a butterscotch chip in the center of each. Arrange 5 cherry slices in a circular pattern around each butterscotch chip to resemble the pattern of a poinsettia. 6. Bake for 10-12 minutes, or until the cookies are firm but not brown. Cool the cookies for about 1 minutes on the baking sheets then transfer them to wire racks to cool completely. 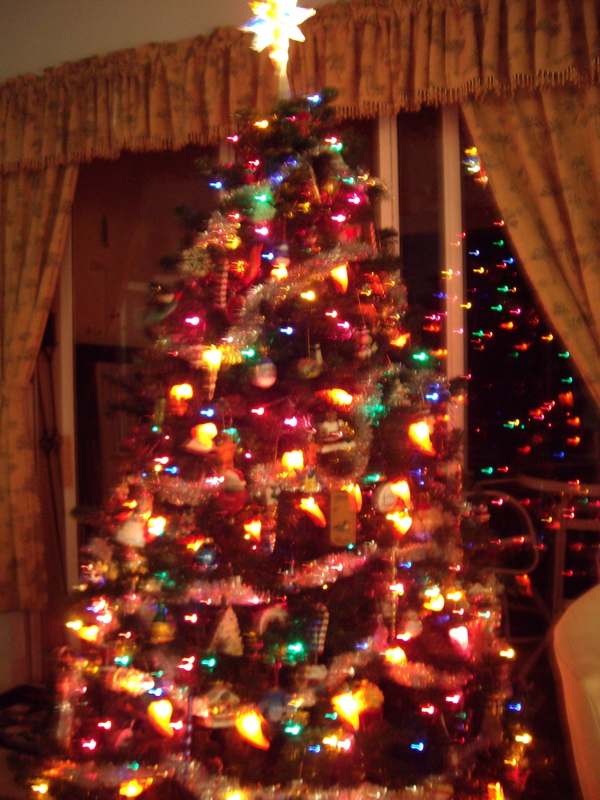 Ok my Christmas tree is up and decorated! Woo Hoo! Now I just need to clean up and finish up the loose ends for the inside decorating. Spent all morning and part of the afternoon Christmas shopping so I got a late start on the tree today. I had promised myself I would write the blog in the morning also. Didn’t happen! It is amazing that even though I am not working (unemployed but not by choice!) you would think I had so much time on my hands! I seem to have even less. Looking for a job is a full-time job in itself so I am happy to take time and just write about my recipes and research photos and just escape into my own little food blog world. It’s a great place! 1. Preheat oven to 350º. In a large bowl, beat the brown sugar and butter with an electric mixer on medium speed until light and fluffy. Beat in egg, pineapple with its juice, and rum extract until well blended. 2. Add the flour, baking powder, baking soda, and salt. Beat until well blended. Stir in oatmeal and coconut. 3. Drop by teaspoonfuls onto greased cookie sheets. (Those silicone mats or parchment paper work great also). Bake for 15-20 minutes. Let cookies cook on sheets for 2 minutes, then remove to a rack and let cool completely. This is a really cool looking martini. The blue portion is Hpnotiq liqueur. It’s a wonderful tasting liqueur but you have to be very careful when drinking it. Make sure you will not be driving or operating heavy machinery. This is no joking matter. People have been known to do really dumb things “On Hpnotiq”. For instance, jumping into a pool and forgetting to take the keyless remote for the car out of your pocket. Several hundred dollars later….It is really tasty though. It does look a little like windshield washer fluid but sure goes down nice and smooth. So have a safe and happy July 4th! 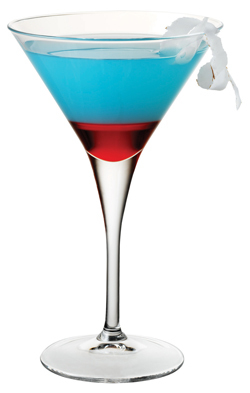 Shake all ingredients (except the Grenadine) with ice, strain into a martini glass and slowly add a touch of grenadine. Garnish with chopped coconut.